It was lovely to be involved in a wedding by Cranberry Blue Weddings that was subsequently featured in Your London Wedding Magazine. Have a look at Alina and Ahmed’s wedding photos here. We’ve worked with Melanie and her team at Cranberry Blue Weddings a few times, and we can safely say these are some of the beautiful weddings you will find in our land – and probably internationally! With her fashion background and her incredible eye for detail (as well as vast organisational skills), Melanie is a dream planner. In other words, she can bring dreams to life. 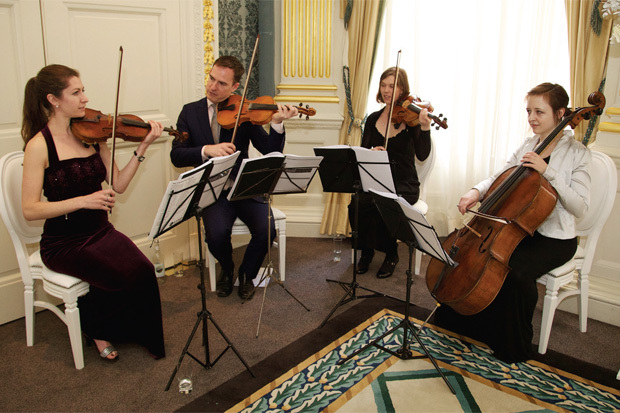 Supplying our quartets to her weddings is always very clear and straightforward, as she always respects our requirements as well as her clients. The level of respect she and her team have for all suppliers magically brings out the best in everyone on the day. So you get as close to perfection as is humanly possible. In this wedding, she effortlessly takes on enhancing the Art Deco glamour of the already beautiful Claridge’s. She compliments the surroundings and brings the day to life. We can write so much, but just look at the lovely photos by Victoria Grech and you don’t need to read anything else. Needless to say, it’s a perfect venue for a modern string quartet. The acoustics are great and so is the lighting. The elegance of the surroundings go well with the elegance of a quartet and we’re able also to compliment those surroundings with music from the era – Duke Ellington, Cole Porter, Gershwin, etc. And classical music of course works perfectly here. We also have our vintage jazz bands that will both look and sound the part and bring that old-world glamour to the live soundtrack. Or why not have a top class DJ for everyone to dance the rest of the evening away?